This page is about the American medium tank M60. For other uses, see M60 (Disambiguation). The 105 mm Gun Tank M60 is a Rank V American medium tank with a battle rating of 7.7 (AB/RB/SB). It was introduced in Update 1.51 "Cold Steel". M392A2 APDS (Armour-Piercing Discarding Sabot) is capable of easily penetrating the majority of the foes it meets, but these rounds do require finesse as to their placing. Because the shell lacks an explosive filler, the best bet is to try and either knock out the majority of the enemy tank's crew, or to destroy the enemy by ammo or fuel detonation through hitting their respective storage capacities. This, of course, requires knowledge about the vehicles the M60 may face - so be sure to use the game's X-Ray view in the hangar and analyse the potential foes for their weak spots! Also keep in mind that with increased armour thickness the amount of shrapnels shrinks. M456 HEAT-FS (High-Explosive Anti Tank Fin Stabilised): The knowledge of enemy vehicle layouts gained from the stock shell (DM13), will be handy to use for the M60's fullest potential - as the M456 is a round that can penetrate most vehicle's armour frontally. Like the APDS shot, increased armour thickness results in reduced amount of shrapnels after penetration. Unlike APDS it has one downside: Given that it is a chemical energy round, its fuse is highly sensitive in regards to its practical application in battle. As a result, virtually anything, such as trees or even a fence, will set it off prematurely, so the HEAT-FS round cannot fire through obstructions with this kind. M393 HESH (High-Exlposive_Squash-Head) works very differently than other shell-types. It ignores any angle, except for ricochet and deals damage by metal-flakes which are blown off inside the armour by the exterior explosion. Basicly the fighting compartment is showered in metal rain. Currently only true armour thickness (opposed to line of sight thickness) will provide sufficient means of protection, benefitting the USSR turret designs and in general German tanks. Like all high-explosive shells the fuze is very sensitive and can be set-off by most objects e.g. fences, trees, pillars. Ammo racks of the M60. A good play style for the M60 is to use it's off-road and speed capabilities to the M60's advantage by flanking around the side of map. Catching the enemy unaware on their sides or rear will make the most out of the 105 mm cannon against their thinner armour and will be able to destroy them. Frontal engagement is not encouraged due to the armour possibly being penetrated, but the M68 gun can provide a winning edge if firing the first shot. To use this tank effectively do not charge straight into battle, instead go around. Use the terrain, make it harder to be identifiable by selecting the appropriate camouflage and navigate using the map. To flank the opponents from the sides or the rear, use a flanking tactic to surprise the enemy tankers and destroy them. However, do not let the M60 be seen and the longer it can stay hidden, the higher the chances of finding more tanks off guard and surviving the match. Try to attack from long distances: The M60 has a very powerful and accurate cannon. This can be equipped with some of the most lethal ammunition in the game. It will turn the biggest and most powerful tanks into blazing wrecks. The M60 looks similar to the T-54 series of tanks an unskilled T-54 player will pause for a short amount of time to identify the tank. This will give the tank extra time to angle the tank and to calculate a perfect shot and destroy vital parts of the enemy tank. Do not expose/show the rear of the tank as this will give away the M60 immediately, since the rear does not resemble a T-54 and is one of the weakest places on this tank. Playing on maps which have villages, towns, and city centers modeled, such as: Poland, Advance to the Rhine, Normandy etc. These require a more specific tactic to survive in these locations as being flanked and not knowing about it until it's too late is very common. A good way of preventing this while using an M60 tank is to not enter the urban environment. In these environment, the M60 will be normally too close for the armour to work as effectively. However, if going around the sides of the town and move in and out of streets, this will prevent the enemy team to predict where the M60 will go. The M60, once upgraded, offers some of the best handling in the game, use that as an advantage in narrow and congested streets. 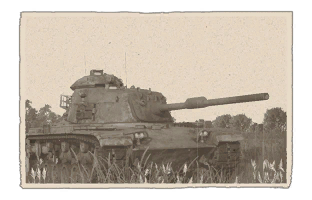 When engaging with other medium tanks, the M60 offers an excellent gun which can dominate any other medium tank. If the HEATFS is unlocked, the M60 will be able to terminate any tank with one hit most of the time. The closer to the enemy tank, the higher the odds of ending it with a instant termination. 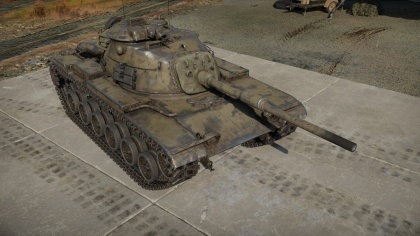 When using HESH rounds, do not hit the sides of the enemy tank, it won't really do much damage. However, when the enemy has exposed the front, especially the Upper Glacis of the tank, using the HESH rounds will cause a lot of damage to the Crew and could also end that tank in one shot. Examples are the T-54's, IS-3 and -4M's. 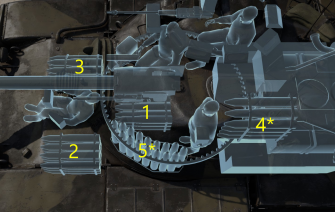 Against T-10M's, its not that reliable because of spaced armour. Make sure to not expose the rear or sides of the tank and turret. These are weakest parts and if hit are likely to end the tank. Very accurate gun at long ranges when upgraded. HEAT-FS and HESH shells available. Very good stock turret transverse speed. Great off road speed (but not as great compared to Leopards and T-10Ms). Front impenetrable against most Rank IV & some high Rank V tanks. Once fully upgraded it offers very sharp handling and maneuverabilty. Excellent acceleration when fully upgraded. Commander cupola Armour is very thin, can be penetrated easily by APCBC and HEAT rounds. Enemy shells can bounce off the turret roof (due to the angle) and could enter the cupola. Commander's .50cal HMG is slower in maneuverability and not as effective compared to earlier vehicles due to the cupola. .50 cal coverage is limited due to commander's cupola. Sides are only 41mm thick, they can be penetrated easily. Turret ring can be penetrated by enemy rounds. Front is vulnerable to HEAT and the most powerful APHE (T-10M, Maus) at close range. No shells with HE core. The M60 was the American response to the Soviet T-54A main battle tank after one was captured by Hungarians during the Hungarian Revolution of 1956. The American main tank at the time, the M47 and M48 Pattons and with their 90 mm cannon, was found to be incapable of defeating the T-54 armour from the front. Plus, with rumor that a new Soviet tank better than the T-54 was in development with a 115 mm cannon (which would be the T-62), the Americans saw a need to upgrade or replace their M48 Pattons. These upgrades are focused on improving the armour, a bigger gun, better rangefinders, and even an auto loader system. At the time, a program designated the T95 launched in June 1954 was meant to replace the M48 Patton with a better gun and mobility. This new tank development was approved in August 1957 and was intended to be a radical change in the American tank doctrine, changing from the World War II era weight classes of light, medium, and heavy tanks and instead classifying as an all-purpose "main battle tanks" or an "airborne reconnaissance/assault vehicles". However, as the development came to a slow speed, it was determined that the T95 series was only marginally better than their improved M48A2 Patton, so it was proposed that the M48 design be upgraded with the new improvements made by the T95 program, focusing on better firepower and fuel efficiency. This development would be designated the XM60. The main gun on the new design was to be the new 105 mm M68 cannon, which was similar to the British 105 mm L7 Royal Ordnance gun made in response to the Soviet T-54 tank, even firing the same ammunition. The decision was made among six different tank guns for accuracy, damage on target, rate of fire, and penetration. The cannon parts were initially imported from Britain until American licensed version could be produced at the same quality. Armour was initially going to be composite armour made out of silica glass in response to better anti-tank weapons being produced. However, during production, the composite armour was changed back to conventional steel due to manufacturing constraints and cost. The XM60 design was accepted in 1959 and standardized as the 105 mm Gun Full Tracked Combat Tank M60 in March 1959, entering service in 1960. During its production life from 1959 to 1987, over 15,000 units were produced. Despite its common naming as the M60 Patton, it is never officially classified as a series of the Patton tanks and only as a "product descendant". The M60 was meant to only be an interim design in the "main battle tank" designation, but it featured many innovative upgrades. The 105 mm gun with a bore evacuator, a straight sloping front armour rather than the rounded one on the M48, three rollers on the suspension and road wheels made out of aluminum. The design also used an improved engine, transmission, and driving unit. M60 design could be cast or welded together, and the turret was largely similar except the different mantlet to accept the new 105 mm gun. The tank had a crew of four, the commander, gunner, loader, and driver. The M60 was the last American tank to feature conventional steel armour in its design. The M60 started with its base variant, which was very similar to the M48 Patton, the differences between the two being a wedged-shaped hull, three return rollers, and aluminum road wheels. The next one is the M60A1 variant, which began production in October 1962 with a better "needle-nose" turret, improved armour protection, and suspension. This was meant to be the main variant, but the development of a "main battle tank" was slower so the M60A1 served much longer than its intended period, from 1960 to the 1980s. Another variant to be made was the M60A2, which had a changed turret design and had the 152 mm gun found on the M551 that could fire standard HEAT shells or an anti-tank missiles, but this variant was found to be unreliable and was phased out quickly. The last major variant was the M60A3, which featured many technological enhancements with a new rangefinder, ballistic computer, and a turret stabilization. This tank is the most modern of the three variants and is still being used by certain countries with even some advantages over the American main battle tank M1 Abrams during its introduction with better thermal sights, diesel engine, escape hatches, variety in ammunition, and ability to act as an artillery. The M60 in American service were first deployed in Vietnam, but only as engineer vehicles or bridge layers. The M60s continued to serve in American service all the way to the Gulf War in Operation Desert Storm in the Marine Corps and Air Force, however at the time the newer M1 Abrams in service were already replacing the M60 tanks. Despite that, they did well in combat, where M60A1s in Marine service fought an Iraqi force composed of Soviet T-54s and T-72s and destroyed 100 tanks with the loss of only one M60 tank. The M60s were all retired after 2005 in US service. Israel was another large user of the M60 tanks, seeing service in the Yom Kippur War with the quantity of 150, but many were destroyed by the new anti-tank missiles supplied by the Soviets to Egypt. It was widely praised for its firepower and maneuverability however, and many were upgraded with better tracks and armour in the form of explosive reactive armour to combat anti-tank missiles. They saw service again in the 1982 Lebanon War against T-54s and T-72s and even World War II era T-34s. The M60 in Israeli service were retired by 2014. Today, the M60 tanks are still used in many different countries, such as Egypt, Brazil, Greece, Iran, Turkey, Yemen, China, and more. Despite its age, attempts at upgrading its armour and armament had been made American defense contractor Raytheon, able to keep the M60A3 up to date with the newer M1A1 Abrams with the 120 mm Rheinmetall gun and reactive armour. Skins and camouflages for the M60 series from live.warthunder.com. This page was last edited on 19 March 2019, at 21:08.